2. 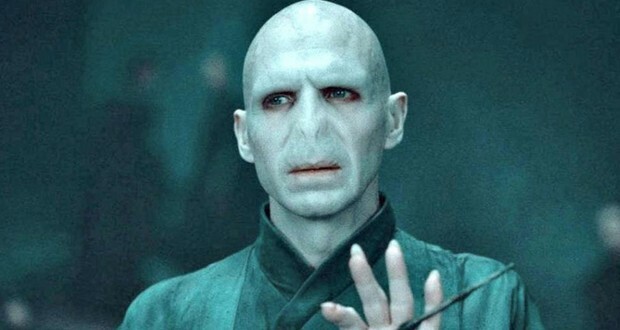 In the Lego Harry Potter series, Voldemort is the only character that has a nose. 3. Harry Potter and the Deathly Hallows, the last book of the series, is set in 1998, the same year the first book was published in America. 4. Hogwarts is only open to the residents of Ireland and Britain. According to J.K. Rowling, brooms are not actually magical items that allow wizards to fly. Like wands, they are simply tools for wizards to channel their own magic through and talented wizards can fly without them. 7. While filming a scene between Bellatrix Lestrange and Neville Longbottom in Harry Potter and the Order of the Phoenix, Helena Bonham Carter accidentally stabbed Matthew Lewis in the ear with her wand, busting the actor’s eardrum. 8. Bruce Springsteen wrote the song “I’ll Stand By You Always,” for a Harry Potter film, but said the producers of the movie didn’t want to use it. 9. There is a first-edition copy of 'Harry Potter and the Philosopher's Stone' amongst Earth's most important artifacts preserved aboard Platform One in the Doctor Who episode "The End of the World." 10. The first 'Harry Potter' book was initially rejected by twelve different publishers, as it was considered too long for children to read. Voldemort's wand is made of yew. The plant is seen by some as having immense supernatural power and being a symbol of death and rebirth, representing the same immortality that Voldemort seeks. 13. J.K. Rowling revealed that after the Battle of Hogwarts, Hermione tracked down her parents and restored their unaltered memories. 14. Harry, Ron, and Hermione became memorialized in Chocolate Frog cards after the Battle of Hogwarts, of which 'Harry Potter' author J.K. Rowling said, "Ron will describe this as his finest hour." 15. During the shooting of Harry and Hermione's kissing scene in 'Harry Potter and the Deathly Hallows: Part 1', Rupert Grint, who plays Ron Weasley, was asked to leave the set for laughing too much. Though he was ultimately cast as Draco Malfoy in the 'Harry Potter' film series, Tom Felton initially auditioned for the roles of both Ron Weasley and the title character. 17. Fred and George Weasley were born on the first of April, 1978, April Fools' Day. 18. Fourteen Ford Anglias were destroyed to create the scene where Harry and Ron crash into the Whomping Willow. 19. Rupert Grint has a very real case of severe arachnophobia, to such a degree that he has still not watched the entire scene where Aragog and the spiders appear. In that scene, the look of fright on Ron’s face and his uncomfortable squirming throughout was not from acting but was due to Rupert being legitimately terrified. 20. The set for Dumbledore's office was, at the time of its construction, the most expensive set built for the films at that time. Both director Chris Columbus and production designer Stuart Craig agreed that, as headmaster, Dumbledore should have the most elaborate office possible. However, they were informed that the proposed design, with its massive stone columns, bookcases, curio cabinets, paintings on the walls, tables filled with various objects, antique desk and throne-like chair, and a giant telescope, would be far too expensive to produce. The producers ultimately were able to secure the funds needed to build the set. On an episode of ‘Have I Got News for You’, the panelists discuss an article claiming that the Russian President (later Premier) Vladimir Putin was deeply disturbed and offended that Dobby the House-elf seemed to have been created in his image. There is an undeniable resemblance either way. 22. In the opening of the film, when Hermione is called down to tea, we can hear her parents talking about Australia along with an announcer, presumably on the TV, talking about a country-side. This is a reference to the book, in which Hermione says she not only wiped herself from her parent's memories but gave them new identities and made them think that they'd love nothing more than to move to Australia, which we presume that they do. 23. David Holmes, 25, Daniel Radcliffe's stunt-double, was seriously injured on the set of Deathly Hallows. He was performing an aerial sequence when he fell to the ground following an explosion, which was part of the stunt, and sustained a serious back injury. Although he initially hoped to return to work, it has since been reported that Holmes is paralyzed and now uses a wheelchair. 24. 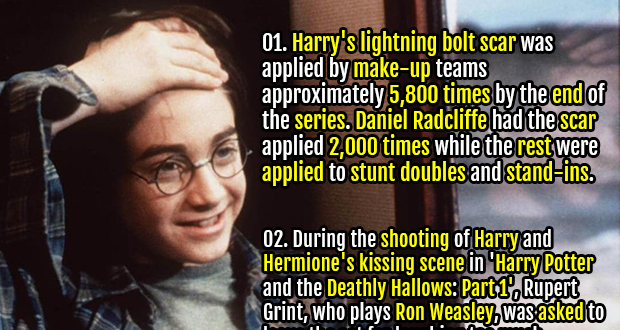 Harry's lightning bolt scar was applied by make-up teams approximately 5,800 times by the end of the series. Daniel Radcliffe had the scar applied 2,000 times while the rest were applied to stunt doubles and stand-ins. 25. Rupert Grint and Emma Watson stated in an interview that they both had casts made of their buttocks ("bum casts") which were used to make the bicycle-like seats mounted on the broomsticks in order to make them more comfortable to ride.